Note this interview has been slightly edited to fit within the 10mins allowed on YouTube. The full interview can be found at the RTRFM understorey webpage. Interview was broadcast on the 18th November. In addition to working to for the Conservation Council, the Squid is also the Australian Coordinator for the powerful new documentary The End of the Line Since Australia’s first screening in Margaret River organised with Save Our Marine Life and the Surfriders Foundation, the film has screened over 22 times in semi-theatrical community screenings around the country. The film has had an amazing effect on audiences and will change the relationship you have to the sea and seafood – for the better! The film gives a wake up call on the reality of overfishing in our oceans, and then a message of hope -if we act now. The cinema release is expected in April 2010. Contacts for the film here. Note that the new Australian Distributor DV1 is now taking all bookings for screenings, contact Tiphanee at tathans@ovationchannel.com. From the Geraldton Guardian, Premier Colin Barnett proudly wields a shovel to dig the first sod of the new Karara BIF Magnetite mine, right next door to Mungada Ridge where mining has also recently been approved against the advice of the EPA. Mining at Mt Karara was allowed on the condition that Mungada Ridge be protected to ensure conservation values lost at Karara will be protected. To take action click on the “Take Action: Email Barnett” tag at the top of this blog. 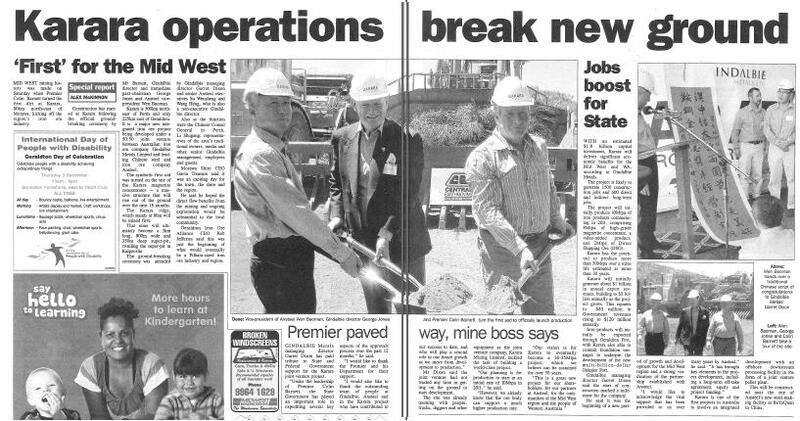 On the same day the Premier was in The West Australian digging the first symbolic sod out of Barrow Island Nature Reserve, marking the start of construction of the new Gorgon LNG facilities on the island.